Go into any convenience store or pharmacy in Japan and you will see rows upon rows of these little vials stacked strategically in a corner. The claims? Packed chock full of collagen, vitamin C, vitamin B6, niacin and, in the case of this one in particular, fiber – you know, all that good stuff said to make you more beautiful from the inside, out. I cannot vouch for their efficacy in the beauty stakes, but having a vast array to choose from, Japanese women appear to swear by them. I usually drink them before bedtime when I’m feeling run down; I believe (rightly or wrongly) that the vitamin C gives me a boost to rise and shine enthusiastically and energetically the next day. 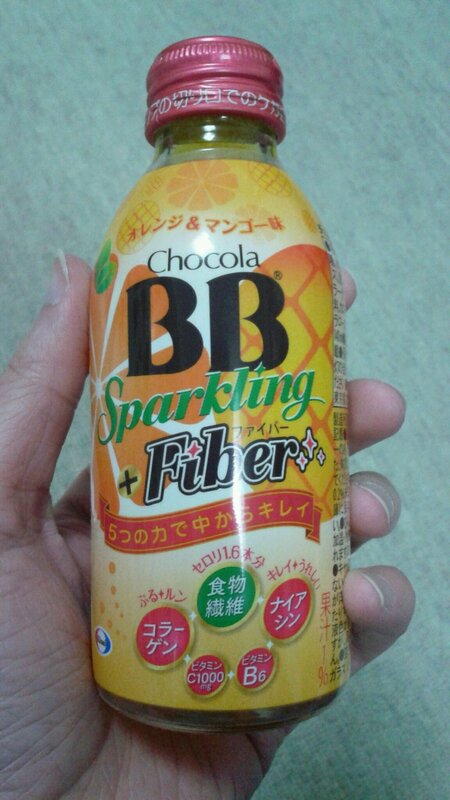 This new offering by Chocola BB is Orange and Mango flavour, and I think it’s quite tasty (but then again, I do like mangoes a lot). It is a bit fizzy, and leans more towards mango than orange. It’s a nice change, and does provide your taste buds with a bit of a kick – mine being confronted with gallons of tea day in day out, I’m sure they like being shaken and stirred a bit on occasion! I highly doubt that I will be consuming it daily for its purported babelicious inducing qualities, but I will definitely be turning to it when I need that hit of vitamin C when I’m flagging at work (read – when it’s crazy marking time). However, if I do find on waking tomorrow that I have suddenly turned into a superbabe, a stunning silver screen siren to rival all others, the quintessential vision of beauty evoked by poets across the ages, you can bet your… well, anything you like, that I will be swilling it every night with my dinner instead of a glass of wine! (Not that I actually do that, but I have considered it). I’ve never been so excited to go to bed! It’s so cool to get a peek into Japan through your blog!